Just one day after he was named as the NFC Defensive Player of the Week, Chicago Bears safety Eddie Jackson received an even bigger honor on Thursday. 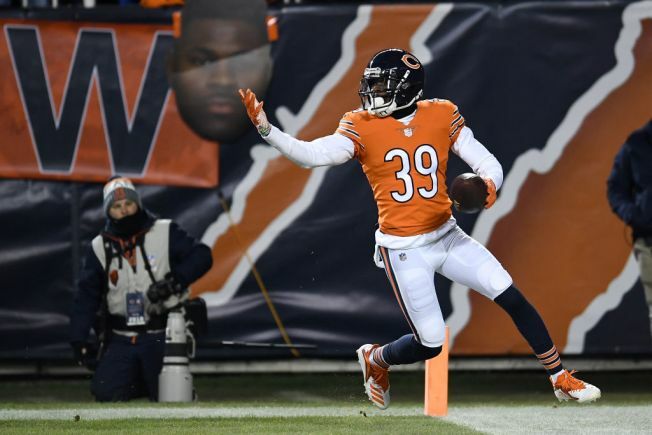 Jackson, who has had an interception return for a touchdown in each of the Bears’ last two games, was named the NFC’s Defensive Player of the Month for the month of November. It was a banner month for the safety, as Jackson scored a total of three defensive touchdowns and registered 15 tackles and four defended passes in the team’s four games in the month. He was a big part of the Bears’ current winning streak, which stands at five games as they prepare to take on the New York Giants on Sunday afternoon. The Bears have now won the Defensive Player of the Month award twice this season, as linebacker Khalil Mack collected the prize for his dominant September. According to the team, Mack and Jackson are the first pair of Bears teammates to each win Defensive Player of the Month honors since Charles Tillman and Tim Jennings each won in different months in 2012.